If your desire is to create the perfect work environment - where people are motivated, trust one another, and share similar goals and visions - and to establish an atmosphere of hope regardless of what your organization is going through, then Achieving Credibility is the blueprint for you. In our era of companies that we hear negative things about almost weekly, where leadership is mistrusted and the foundational principles of organizations are abandoned, where the bottom line is the only thing observed, Jim Kouzes gives us a breath of fresh air and hope that you can build an organization for which good morals and values are the foundation and which can be extremely successful. His powerful examples are throughout this program will inspire you. 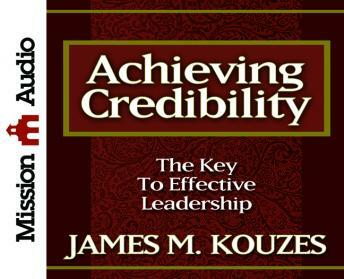 While leadership is Kouzes' main thrust, his themes of trust, honesty, sensitivity to diversity, sustaining hope, and engendering community are skills for anyone who works with people. With employees, bosses, customers, vendors, business partners, with family and friends ... we need to be credible with all the people in our lives to accomplish almost any objective we set for ourselves. This is a must-listen for all managers, leaders, entrepreneurs, and professionals who can't do their job alone. Includes a special introduction by Tom Peters.